This is my 19th installment of Babywearing Stories 365. Each installment features a babywearer in 1 photograph and their answers to 5 questions. My goal is to normalize, promote and celebrate daily Babywearing, moving beyond *what* we use to carry our babies and shifting focus back on *why* and *where* we carry. I hope to share the stories of moms, dads, and babywearing caregivers all over the world. Enjoy! This is a picture of me wearing my 1 month old daughter Mercy Claire. My husband and I were at a friend’s house helping them paint before the moved in. Our family was helping our friends paint and finish last minute renovation details on their new home in western Florida. Mercy was having a great time watching mama and daddy paint but when she was nearing nap time, my little girl wanted nothing else but to be held by mama. 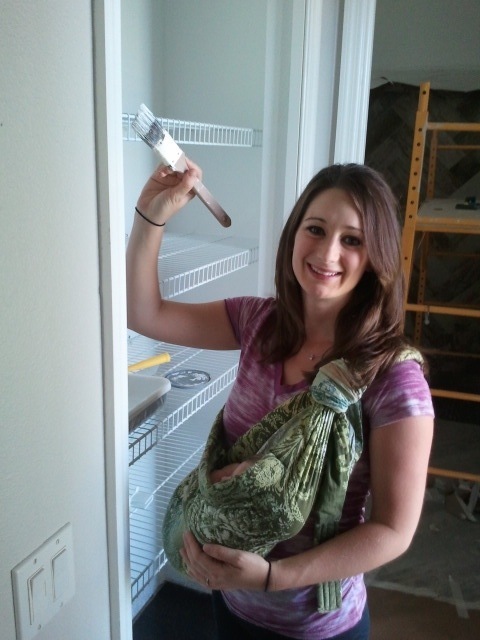 I didn’t want to sit around and watch everyone else work while I held my sleeping baby, so I wrapped her up in our sling and she snoozed while I painted the trim on the doors. We have several slings, but the one here is just a cheap one I bought on a whim on amazon. It’s called “Lite On Shoulder”. Even though I prefer our Maya Wrap Ring Sling, I chose to use the Lite On Shoulder because if I ruined it with paint I wouldn’t be devastated! Mercy is now 1 and I wear her all the time in her ring sling, although now she sits on my hip like a big girl instead of snuggled up like she used to as an infant.